Oh, french fries….I truly can never have enough. I adore all varieties and am always eager to experiment with new versions. I whipped up these Baked Cornmeal Crusted Sweet Potato Fries one day when I had not planned my meals for the day and needed a tasty, year healthy side dish to serve my kids’ with their hot dogs for dinner one night (don’t judge….they were organic, nitrate free ones at least). I had some extra cornmeal sitting in my pantry and decided it might be fun to coat the fries with that instead of panko, which I had originally planned. A few extra seasonings and these turned out delicious! If I was feeling a bit more energetic that day, I would’ve come up with some tasty, yogurt based dip for them, but alas, I did not. So ketchup did the trick, and the fries were a hit. 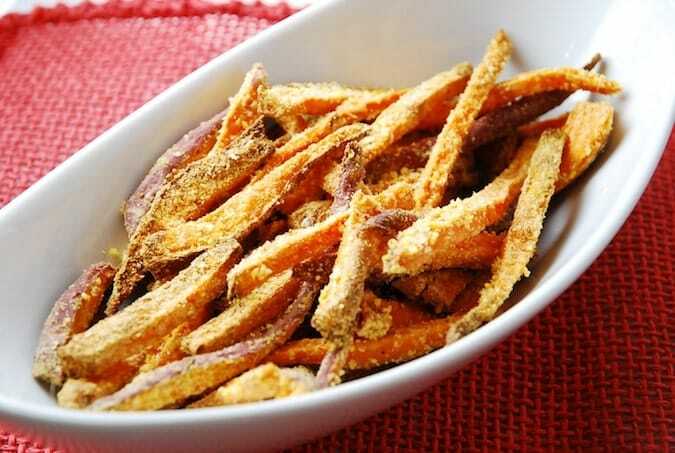 Crispy sweet potato fries that are perfectly seasoned and coated with a cornmeal crust, this dish is always a family favorite. A lot healthier than fast food fries, and still absolutely delicious. After slicing potatoes, place in a bowl of cold water and swish around for a minute. Let sit for about 10 minutes, then drain and pat dry with paper towels. Preheat oven to 400 degrees. Line a large baking sheet with parchment paper and mist with cooking spray or an olive oil mister. Place fries in a large ziplock bag. Add oil and shake well to coat all the fries. Add in remaining ingredients, and shake to coat. Spread fries out evenly on prepared baking sheet, being careful not to overlap, and place in oven. Cook for about 30-40 minutes, or until fries are crisp and browned.